Commercial and business landscaping projects often lead to a multitude of choices that must be made. In an effort to prepare for an upcoming commercial landscaping project there are 3 things that should be considered. Committee members should consider the focal point when it comes to business landscaping. The entryway to an office park, homeowner’s association, or corporate building makes an eye catching centerpiece. 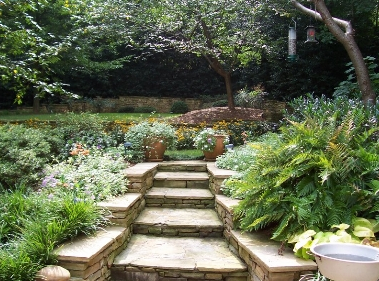 As a result, the design considered should integrate hardscaping such as built in steps or retention walls. Floriculture is a great way to tie in landscaping. Just as a focal point should be considered, it is important to consider the function. Built in steps or retention walls can not only serve as an eye catching element, but they can also make a commercial property much more functional with less erosion and more easily navigated walkways. A well kept landscape or hardscape in front of a business allows not only for a focal point, and better functioning entryway, but it can also make for a friendly first impression. A first impression can only be made once, and it is importatnt to consider what the first impression of your business says about you when it comes to landscaping and hardscaping. Keep in mind that Hutcheson Horticultural Company offers landscaping and hardscaping design and installation. We have years of experience in working with businesses throughout metro Atlanta. Contact us at 770-924-1001 today for a free estimate.